Building and Maintenance Contractors: Buxton, Derbyshire. NSJ Contractors is a family-run business consisting of experienced building, maintenance and refurbishment contractors. We are based in Buxton, Derbyshire and – over the years – have successfully earned a prestigious reputation for the high levels of professional service, quality workmanship and value for money that we offer. NSJ Contractors specialise on new builds, refurbishment and maintenance works undertaking projects ranging in value from £500 upwards to £1.5 million. NSJ Contractors are specialists in the conservation, restoration and renovation of historic and listed buildings. We undertake a number of maintenance roles within both the public and private sector. We also provide a complete service in Mechanical & Electrical (M & E) installation and servicing. 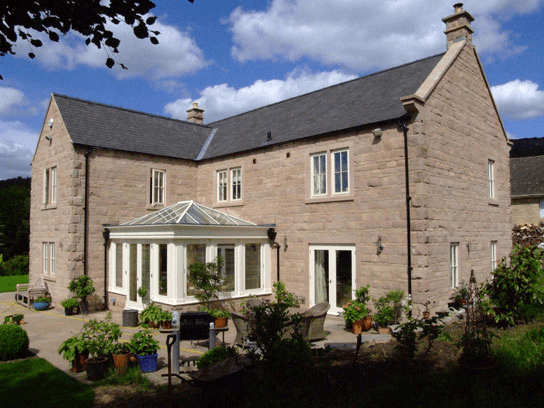 We manufacture and install bespoke joinery products in house – including box sash windows, casement windows, doors, conservatories and a range of purpose-made joinery in hardwood and softwood. A specialist section of our business undertakes building maintenance and development works for a number of schools and colleges. We have specific experience in education, health-care and a range of other public building developments. We fully understand the necessary requirements and expectations within this sector and work closely with school staff to ensure little to minimal disruption. All our staff are CRB/DBS checked. It is our policy to build a personal rapport with our clients to develop a better understanding of their requirements and expectations. CHAS is established as the market leader for Health and Saftey pre-qualification in the UK. Constructionline is the UK's largest register for pre-qualified contractors and consultants. Constructionline helps improve efficiency, time and cost saving whilst promoting best practice. Constructionline has been proven to deliver for public and private sector organisations. The Electrical Contractors Association' is the UK’s leading organisation representing the interests of contractors who design, install, inspect, test and maintain electrical and electronic equipment and services. ELECSA provides inspection, assessment and certification services to contractors working across the building maintenance sector. For more details on any building or maintenance enquiries please contact our Managing Director Nick Chapman on 01298 72328.